Published on 20 November 2012. 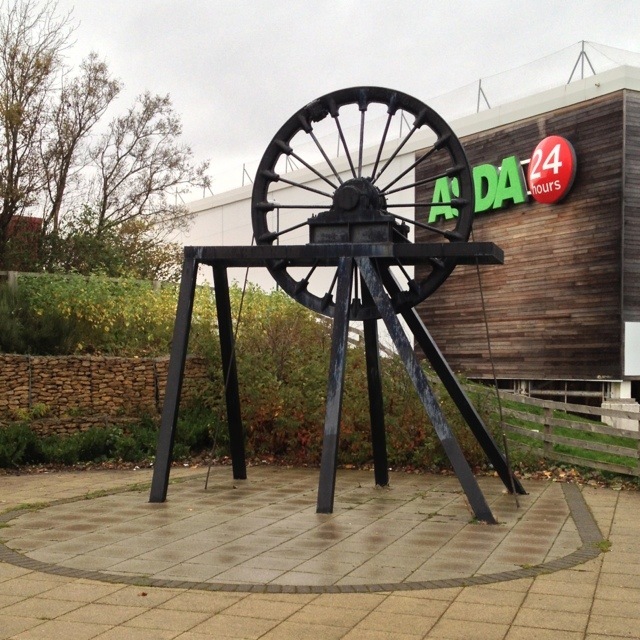 This big wheel is next to Asda in South Shields. I guess it’s related to the remnants of St Hilda’s Colliery which are next to Asda, but whether it’s a bit of the colliery or some artistic interpretation I’m not entirely sure. The colliery was active for 130 years, during which 118 miners were killed, many of whom were in their teens or early twenties. Some were as young as 9. Fifty-one miners died in a methane-fuelled explosion on 28th June 1839. Next time someone complains about ‘elf ‘n’ safety, remind them that there are few workplaces these days with mortality figures quite like that. This 1,897th post was filed under: Photo-a-day 2012, South Shields.